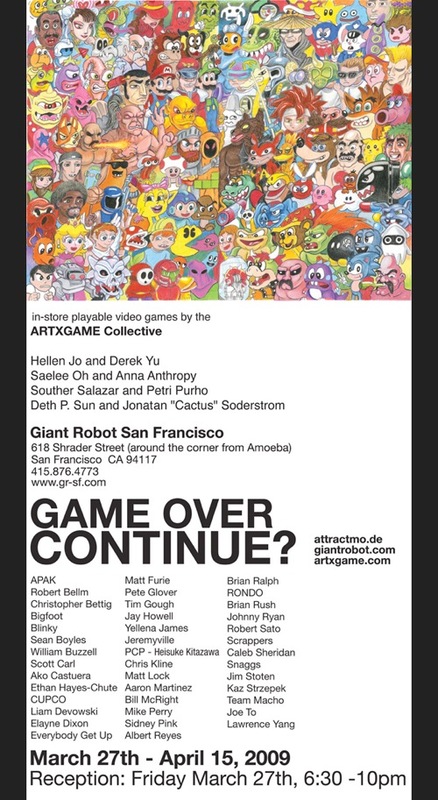 So Adam of Attractmo.de, curator of Game Over: Continue, was in town to work on the upcoming gallery show. “Did you go to the first one?” Adam asked me. Game Over: Continue opens at GRSF on March 27. Check out the list—there’s art from trailblazers like CUPCO, Jeremyville, and Bigfoot. Plus, four special game/art installations will be playable in-store. Attract Mode – Game Over II Is Now Game Over/Continue? Kevin Bunch’s Otocky retrospective reminded me that Bit.trip: Beat just arrived on WiiWare! After rearranging my Wii’s disk space to accommodate the comparatively large download—catch you on the flipside, Paper Mario—I settled in for some truly excellent, old-school synesthesia. Bit.trip: Beat is a paddle game: think Arkanoid, Breakout, Pong or, ahem, Circus Atari. Here, though, the paddle control is gracefully approximated by very gently rocking the Wii remote forward and back. As with classic paddle games, the controls are ‘twitchy’ and require only very fine movements. Your onscreen ‘paddle’ (which is to say, your avatar, or, you know, the line) moves vertically along the far left of the screen, and little pellets fly onto the screen from the right, hurtling toward the paddle. And the point is to hit them. Simple. Each pellet represents a kind of a musical note, too, so as you bat the pellets away, the game’s melody emerges. So far, easy enough. But as you progress through the game, the choreography of the pellets becomes increasingly intricate. Soon those specks are weaving in and out of one another, changing shape and size, or cruelly altering their course midflight. In that way, Bit.trip: Beat is a classic gamer’s classic game: it’s all reflexes and pattern memorization. Aleks Krotoski: "After the [Being Indie and Successful in the Video Game Industry] panel, I spoke with Kellee Santiago, one of the creative minds at That Game Company, the folks behind the PlayStation Network’s indie hits fl0w and Flower, about her thoughts on the academic track, being indie and working for the man." This weekend, instead of getting plastered with the rest of the Bay Area, Kohler went to a local thrift store. There, he found just about the most peculiarly convincing Famiclone ever. One commenter suggests that it isn’t really a Famiclone at all. Curious! Can anyone identify this machine? 1UP Blogs (RSS) – Specialized blogs about games and game culture. Levi Tinney (@vsrobot) sez: "Hey, you can subscribe via RSS to all the 1up Blogs in one feed!" Includes columns like ‘A Taste of Homebrew,’ stuff by Ray and Jeremy, and a ton of Apple stuff. "The PlayPower organization’s mission is to turn cheap, ubiquitous 8-bit ‘TV computers’ (read: NES/Famicom clones) into ~$10 games-enabled learning devices for the developing world (versus manufacturing custom hardware, as with the OLPC), and they’re enlisting a lot of familiar names to help kickstart the program." Chris Person sez: "I don’t know why, but I’ve been listening to this mashup of Phoenix Wright and Jay-Z that @gkokoris forwarded to me. Like, over and over. It’s not even very good, I just can’t stop listening to it!" This really is terrible. I’m hooked. I’m really, really bad at Eliss, the multi-touch plate-spinning game for iPhone. I think my failure falls somewhere in my personal Venn intersection of shortsightedness, panic, and a total lack of coordination. You’re nodding and thinking to yourself, “Stop worrying! No one can be that bad at Eliss.” You’re wrong. I am starting to realize there is something genuinely wrong with me. There are 20 levels. I passed the first stage after a day of trying. I can’t pass the third stage. I can see what needs to happen, and I want to make that happen, but I’m graceless and stupid, my brain motoring at half-speed. I’ve shown Eliss to others, demonstrating its artfulness and my stupidity. Friends invariably pluck my iPhone from my hands, to show me how it’s done, and then they don’t want to give me my phone back. “Stop beating my phone game,” I snapped at Scott Sharkey, grabbing at my phone. I put my iPhone somewhere private he couldn’t get to it, like in my purse or in a drawer, I can’t remember. Scott smiled at me quizzically. This is so frustrating because Eliss is obviously the raddest game for the iPhone yet. And I can’t play it! It’s right in front of me, and I can’t do it! I’d wanted to talk about it once I’d played it except I can’t. I can’t do it. And everyone else can! Anyway, you’ll love it. It’s a $3.99 download. "Hideo Kojima and his hour-long, near-nonsensical, soap opera cut-scenes don’t value your time. Fortunately, your time is now worth next to nothing." It would be just another diggbait trash piece, but it isn’t. Robert Ashley is just that good. "’I think a lot of the conversation these days is myopic,’ said Marcus Brauchli, executive editor of The Washington Post. ‘The problem is how to monetize all content, which is not simply how to solve newspapers problems. Our problems are ultimately the same as the movie industry’s, the book industry’s, the magazine industry’s, the music industry’s. We all meet on a vast, flat digital plane, which is a sort of Hobbesian, anarchic, unordered place.’"
Look, I realize that Mac gaming is, on the whole, an oxymoron, like ‘jumbo shrimp,’ ‘diet cake,’ and ‘libertarian.’ And if you want to play on your Apple laptop, why, you’re even worse off—seemingly relegated to ports, casuals, freebies, and castoffs. Until recently, even Apple admitted you were better off dual-booting into XP. But you bought a MacBook Pro anyway, knowing full well what you were signing onto. “It’ll be a dedicated workstation,” you told yourself. “I’ll only do work on it; I’ll be careful with disk space and RAM; I’ll spend all the rest of my days trying not to covet PC gaming.” But one morning you woke up and you realized iMovie wasn’t cutting it anymore. I need to download ten games that are totally ideal for my MacBook Pro. That’s what you said. That’s what you sound like. Fortunately, I was sitting at my word processor when I distinctly heard your cry of despair. And your cry of despair coincided with the 25th anniversary of the Mac, erm, two weeks ago. What luck, then, that I’ve made this list of ten games! Each one is downloadable, every one, ideal for MacBook gaming. Enjoy! A few days ago, Jeff Grubb tweeted that Petri Purho’s just-released Crayon Physics Deluxe was, at that moment, the subject of NPR’s “All Things Considered.” I am an admirer of National Public Radio, so of course I tweeted back, and soon after, Alex Litel saved the day with a link to the audio. Team effort! Good hustle, everybody! 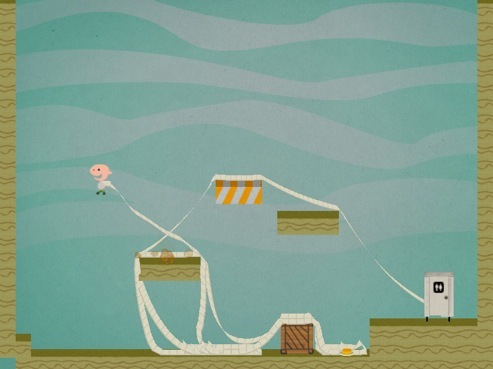 In the video, Petri demonstrates the wicked-cool tablet PC version of Crayon Physics Deluxe. He also demonstrated the tablet PC software at the Bay Area Maker Faire this summer. I loved that Petri was able to describe indie game design in a way my mom could understand. I did learn one new thing from the woefully short (five minutes!) interview: as I’ve always suspected, the children’s book Harold and the Purple Crayon inspired the game. Why aren’t you playing Multiwinia? I thought we struck a deal, here, you guys. I’d periodically mention that Defcon is the greatest game ever made, and then when the time came, we’d all pick up copies of Multiwinia. Right? So why aren’t you playing Multiwinia? 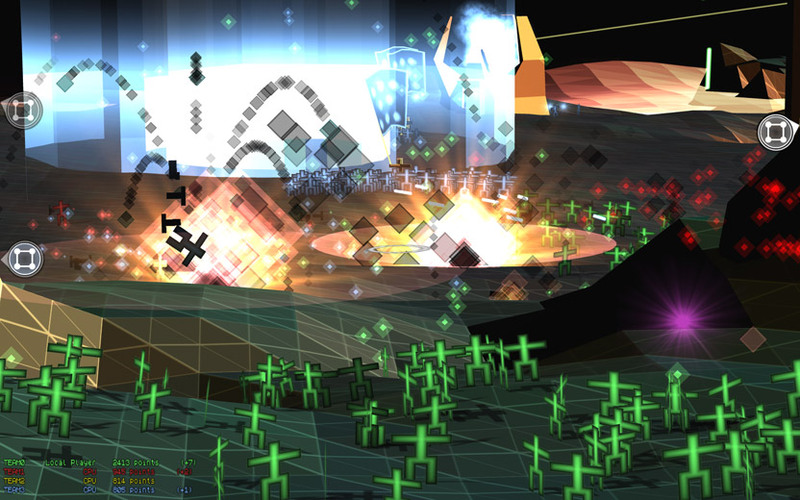 Perhaps you are waiting for Darwinia+ to be released for XBLA later this year (edit: sometime next year)? Understandable! Perhaps you don’t have a PC to play Multiwinia on? I’m right there with you, cowboy. But maybe—no offense—you didn’t know the game had come out? It’s been three weeks since we launched Multiwinia, and today Metacritic shows four reviews (the minimum required for a metacritic average) for the first time since game launch. By comparison, Defcon had nearly thirty metacritic reviews within a week of launch. Of the reviews we have arranged with websites and magazines, less than 20% of them have been published at this time. One british games magazine has declined to review Multiwinia at all—ever. In the end, Delay urges a SAVE MULTIWINIA campaign. There’s only one way to get the word out, folks, and that is by getting the word out. With that said, I made this hip and attention-getting banner. Do with it as you will. The Multiwinia demo is available as a free PC download, here. Tell your friends! I’m kind of loving Philadelphia lately. I love Geekadelphia, from whom I have borrowed liberally (shout-out to Eric!). I love the lads at Gamervision. I love the Liberty Bell and all it represents, which is liberty. And then there’s the VGXPO, which is something that is also in Philadelphia. And now I am completely in love with The Hacktory. 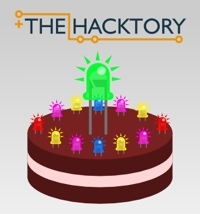 Incidentally, The Hacktory turns one year old this month, hence the illustration of a layer-cake with LEDs that I am ‘borrowing’ from their blog. That seemed new. I looked around. I didn’t see any game stores anywhere. Also, the last time a sign lured me into a “game store,” it had turned out to be one of those D&D hangout places. I’d marched right in with palpable confidence and decisiveness, and then I’d suddenly stopped just inside the door, completely frozen in place as I stared at shelves full of rulebooks. Then I realized all the preteens at the back table had stopped playing—now, they were staring at me in silent horror. And then I went, “Oh,” and slunk out miserably… not because I dislike tabletop gaming, mind, but oh boy do I dislike being sheepish in front of preteens. Anyway. I walked past Star Games again on Friday. This time I was on my way to the Ninjatown DS Sneak Peek at Double Punch. But there Star Games was, cozily glowing in the dusk, just like a cottage in a Thomas Kinkade painting. I was already late to Double Punch, though, so I hurried past. 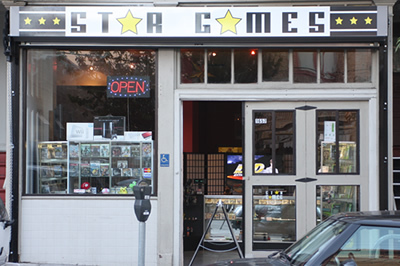 And though I’ve never actually walked into the store, I’m already really fascinated by Star Games: I have never seen an independent videogame store in San Francisco before. Sure, I’ve been to retro and import game stores in New York City and in Chicago. I’ve heard of mythical game stores in New Jersey and Seattle. Even Corpus Christi, Texas, has Play Again. I’ve also heard a pretty believable rumor that one of the Bay Area EBs or GameStops does more business than any other franchised game store in the United States—a credible claim, because our area is chock-full of video game developers, PR, journalists, bloggers, publishing companies, tech industry people, and… well, you know, gamers. Since there’s such a huge, well-informed (and generally well-paid) crowd of gamers here, why hasn’t San Francisco had any notable import game stores up until now? Or, if we ever did, why do they all close down? Isn’t this a primo market for that niche? I’ve long held a theory about import stores, and it is this: many of those stores manage to scrape by and stay open by not selling their inventory. If a store has valuable retro and import games—WonderSwans still in their packaging, for instance, and unopened Zelda CD-i games—those shelves full of priceless, unsold relics turn the establishment into a kind of museum, into a beautiful paean to dusty basements and wasted Saturday mornings. What, then, will Star Games’ shelves look like after everyone in San Francisco has taken off with their HoneyBees? Location, location, location: I am already worried for Star Games because the store is in an accessible location. The game store in Chicago is clever because it is so geographically inaccessible—so, by the time you’ve finally geared up for a weekend trip to the store, you’re only too happy to blow all your money. But I am a loving pessimist. Star Games, the Bay Area is ready to love you. You will be the one to turn the tide. You will be the greatest game store to ever open its doors in San Francisco. Star Games has been open for just over a month. I will visit sometime this week and return with a full report. John Darnielle specializes in melancholy, sometimes sparse narrative-songs, so no real surprise there, right? But nothing could have really prepared me for this. Darnielle, better known as the band The Mountain Goats, collaborated with fellow singer-songwriter Kaki King on the video game -themed single, “Thank You Mario But Our Princess Is in Another Castle.” It’s the final track from Darnielle and King’s upcoming vinyl-only (?!) EP, Black Pear Tree. Stereogum helpfully posted the dates of Darnielle and King’s “Last Happy Night of Your Life” autumn tour, which includes stops in major metropoleis like SF, Chicago, NYC, Austin, and Brooklyn. Concertgoers will be able to pick up the Darnielle/King EP at the shows. 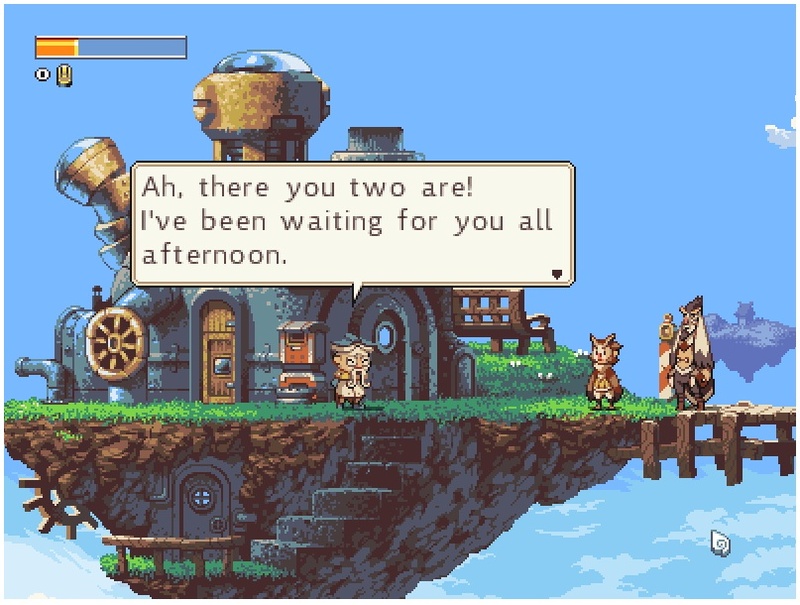 Yesterday, indie dev team D-pad Studio announced their 2D platform/adventure game Owl Boy. In development now, the boys at D-pad expect to have a playable build by March 2009, just in time for the Independent Games Festival. Guessing only from preliminary screenshots, Owl Boy’s splendidly retro art has that rusted-cog aesthetic everyone likes so well. Can’t wait to hear more as it unfolds. Chainsawsuit is a pretty weird comic. It isn’t specifically a comic about video games, but its author does play games. He also thinks about cooking, doctors, and Superman. This strip is from last week. I like it a lot. Prolific game designer Petri Purho doesn’t need a gimmick, but if he has one, it is this: the man is committed to making one new game every month. And he’s no slouch. As Kloonigames approaches its two-year anniversary, Petri has created the Big List o’ Games, a one-stop catalog of his 24 most recent creations. Many of them are must-plays for anyone interested in indie game development—so go check them out! Go on! Shoo! Congratulations on two years of Kloonigames! Who’s flying me to Montreal in November? Anyone? At long last, the fine minds at Kokoromi have announced the Where, the When, and the What of the third annual GAMMA showcase. Presented in collaboration with the Society for Arts and Technology and the Montreal International Game Summit, the event will be held on November 19th, At the SAT, in Montreal. Developers around the world have until October 15th to submit their games. Kokoromi will announce the chosen games on November 1st. And as with every GAMMA event, this one culminates in a great big art show game party with everybody wearing 3D glasses.